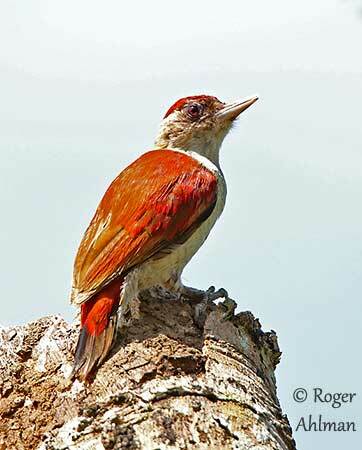 The Scarlet-backed Woodpecker is found in Colombia, Ecuador and Peru, and two subspecies share this range. It is native to the western side of the Andes. 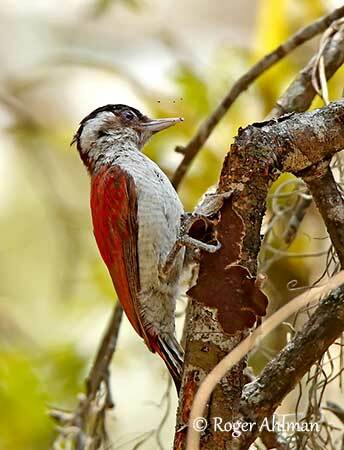 This specie is small with a length of 13-15 centimetres, and it is the only small woodpecker with red back. It frequents dry forest and scrub, and can be seen at high elevation. The Scarlet-backed Woodpecker has expanded its range in Ecuador, following deforestation. It is relatively common and currently not globally threatened. The Scarlet-backed Woodpecker adult male has scarlet upperparts, sometimes with brownish tinge due to some brown feather bases, more conspicuous in worn plumage. On the upperwing, the flight-feathers are dark brown, but mostly redder on secondaries and tertials. The uppertail is dark, mainly blackish-brown, with very dark central pair of rectrices. The outer rectrices are pale yellowish with black barring. The underparts are white to buffy white, or faintly scaled dusky on the breast. On the head, the black feathers of forehead to nape are tipped red, whereas the ear-coverts are greyish-brown. Rest of face is paler, usually white, with sometimes indistinct, narrow, dark malar stripe. The rear neck side is brown. The yellowish bill is fairly long and broad, with straight or slightly curved culmen. The base is usually darker. The eyes are brown with some variations. Legs and feet are greenish-grey. The female resembles male but she has brownish-black forehead to nape and occasionally some white feathers at rear. The juvenile resembles female, but it has greenish-grey mottling above and buff underparts. The Scarlet-backed Woodpecker has two subspecies. V.c. callonotus (described above) is found in SW Colombia (Nariño) and W Ecuador (S to Guayas and coastal El Oro). V.c. major occurs in SW Ecuador (El Oro, Loja) and NW Peru (N La Libertad and NE Cajamarca and NW Amazonas). This race has darker ear-coverts surrounded behind and below by pale area. There is usually heavier dark barring on the underparts. The Scarlet-backed Woodpecker frequents the arid tropical lowlands with desert scrub and scattered trees and cacti, also dry deciduous forests and dense growth along watercourses. The species occurs from the lowlands to 1,000 metres of elevation, and locally higher, up to 1,400-1,800 metres in Ecuador, and 1,500 metres in Peru. The Scarlet-backed Woodpecker produces a rattle lasting 1-2 seconds. We can also hear a sharp “ki-dik” sometimes given in fast series. The Scarlet-backed Woodpecker is often seen in pairs. 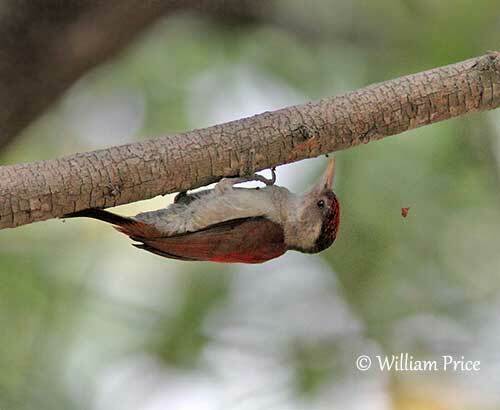 Its diet is unknown, but it forages in trees, on both branches and small twigs where it probably feeds on insects, larvae and various arthropods which are the typical diet of Picidae. It may also consume plant matter including nuts, acorns and fruits. 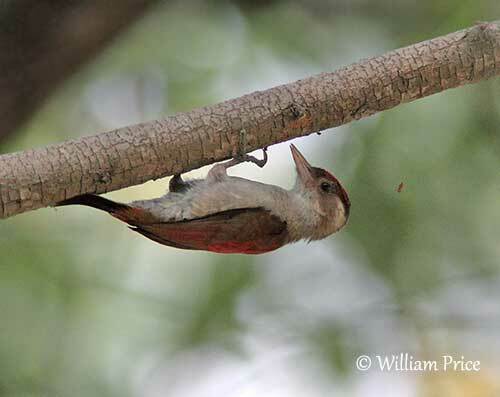 The food items are usually found in wood holes and bark crevices by probing deeply with the bill. The Scarlet-backed Woodpecker is probably monogamous like most Picidae. Nothing is known about its courtship displays, but usually, crown and nape feathers are erected and the head extended to enhance the bright-coloured head of the male. The wings are sometimes drooped. Some aerial displays may occur too. The Scarlet-backed Woodpecker is apparently resident. 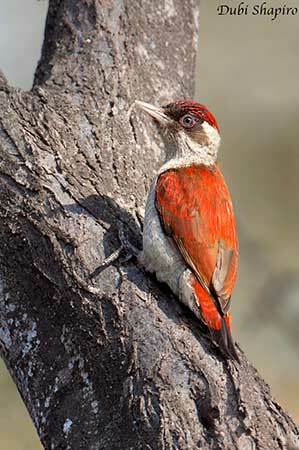 Like all Picidae, it has undulating flight with active wingbeats interspersed with glides on closed wings. The breeding season takes place between May and October. 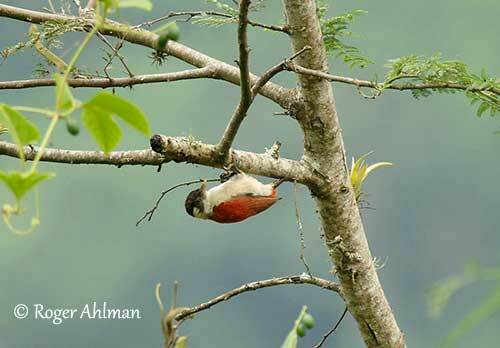 From some observation in W Ecuador, a male with a brood patch and a nest with fledged young were seen in July. Another observation shows two mates copulating in August. The Scarlet-backed Woodpecker probably nests in tree hole. The eggs are white. The Scarlet-backed Woodpecker is described as common to fairly common in Ecuador and Peru, but it is very local in Colombia. The species is present in protected reserves and parks, but since late 1970s, it has expanded its range following periods of deforestation. The Scarlet-backed Woodpecker is currently evaluated as Least Concern.